I’ve never really loved egg salad. Nice way to start a post about egg salad, right? 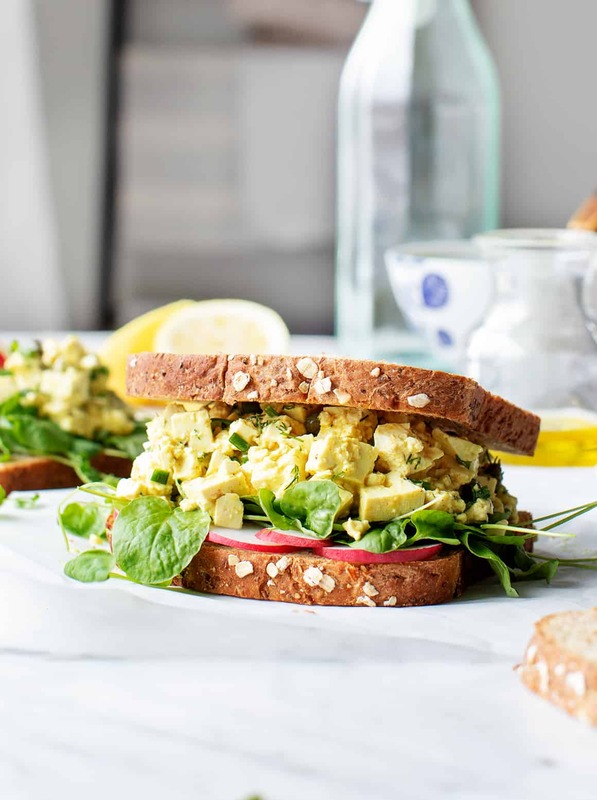 🙂 But this isn’t just any egg salad sandwich, it’s “egg” salad in quotation marks, which means that this recipe is my vegan version and it’s so egg-citing! (sorry, I had to). The filling is creamy, bright, and briny – the best egg salad I’ve had, quotations or not! In fact, compared to traditional egg salads, which I feel can be a bit on the heavy side, this is light, fresh, and what I think egg salad wants to be. Scoop it between slices of whole grain bread, and this is everything I want to eat for lunch every day in the spring. And speaking of that yummy, grainy bread… let’s take a second to talk about bread. I love bread. I’ve always loved bread, but there was a time when I cut it out of my diet thinking that I’d be healthier and I’d lose weight. Since then, I’ve gradually brought it back to the point where I now eat it almost daily. Bread gives me the energy to get through my day, and it’s full of valuable nutrients like fiber that you knead (sorry, I love a bread pun!) for healthy digestion. I realized what works for me (as a non-celiac person) is to ignore all of the confusing diet trends that are out there and to eat mindfully, without cutting out entire food groups when it’s trendy. This makes me feel balanced and healthy. It’s also a more enjoyable and sustainable way to be. And guess what? It’s fun to eat bread! So let’s #sayyestobread and make sandwiches, shall we? 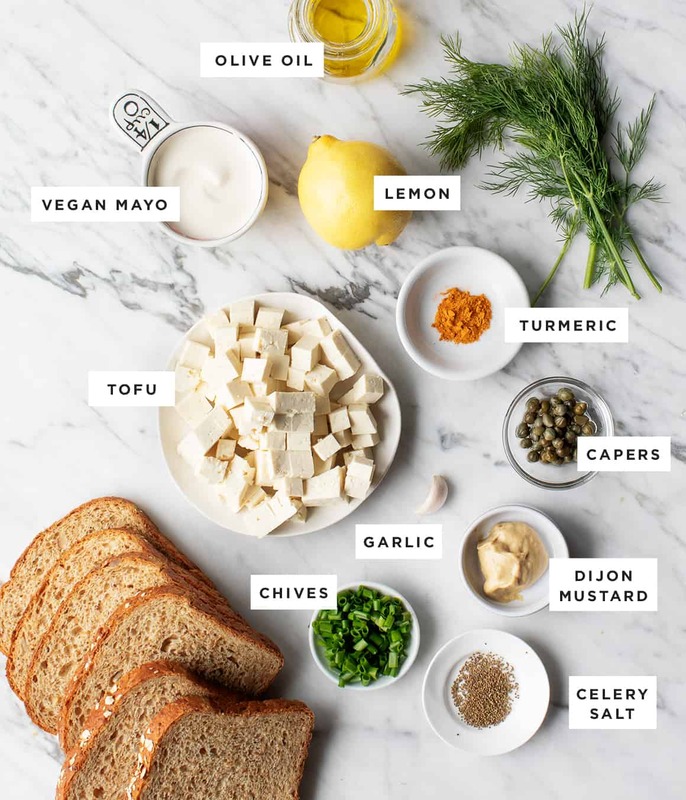 To make the “egg” salad, start by whisking together the vegan mayo, lemon juice, olive oil, Dijon mustard, garlic, turmeric, and capers. Look at that pretty turmeric swirl! Next, add the cubed tofu. If you’re scared of tofu – don’t be. It mimics the texture of eggs perfectly, and since it’s nearly flavorless, it takes on all of the bright & briny flavors of the sauce. Mix in the tofu, then lightly crumble it with your hands, keeping some of the cubes intact. We’re going for the texture of egg salad, not scrambled eggs. Last, stir in the dill, chives, and celery salt. Celery salt isn’t something I usually keep on hand, but Jack’s mom uses it to make her famous deviled eggs, so I thought I’d give it a go in my faux egg salad. It adds the perfect amount of eggy flavor! You could skip it, but if you happen to have it, go for it. To make my sandwiches extra springy, I assemble them with watercress and radish slices, and I top them with pretty pink pickled onions (there’s a recipe for them in this post). Assemble and enjoy! The “egg” salad will keep in the fridge for 3 to 5 days, which makes these a perfect lunch that’s quick to assemble. For more reasons to love bread, click here! In a small bowl, whisk together the mayonnaise, olive oil, mustard, capers, lemon juice, garlic, turmeric, salt, and several grinds of black pepper. Mix in the tofu, then lightly crumble it with your hands, keeping some of the cubes intact. We’re going for the texture of egg salad, not scrambled eggs. Stir in the celery salt, dill, and chives. Chill until ready to serve. Assemble the sandwiches with watercress or spring greens, a scoop of the egg salad, and pickled onions and radish slices, if desired. *This is not an ingredient I usually keep on hand. You can skip it if you want to, but it does help give this salad a bit of an “eggy” flavor. This post is in partnership with the Grain Foods Foundation.